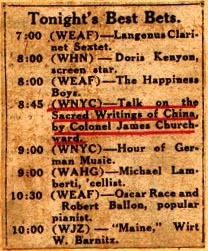 Clippings covering the radio lectures. Many thanks to Historian Yannis Deliyannis, author of the Chronicon Mirabilium blog for his assistance. Review: Col. James Churchward, at WNYC, interested us with his assertion that civilization never came out of savagery, but savagery came out of civilization. He wound up after many deductions, with the famous clincher, Q.E.D. after which there is no more to be said. He spoke of Darwin and his monkey-business in a tone that showed he had a very decided opinion about Mr. Darwin's mental processes, so far as the origin of man is concerned. Colonel Churchyard [sic] regretted that he could not give his talk with illustrations, but his explanations were simple and easy to grasp, and we felt at the end that his Q.E.D. was perfectly justified. (Brooklyn NY Daily Eagle, January 7, 1925). Review: Talking of elocutionary stunts and all that, Colonel Churchward at WNYC used the words delicious fish. He did it without making a mess of it, but we defy anyone to say these two words five times in succession quickly without hashing them. (Brooklyn NY Daily Eagle, January 31, 1925). 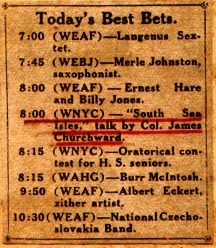 16 WNYC: 08.30 PM The Great Magnetic Cataclysm, Colonel James Churchward. Length: 15 min. (Thursday). Review: Magnetic Cataclysms choked the Municipal Voice of Greater New York last evening, and for a few moments the usual over-powerful WNYC station wheezed and gurgled and then passed out into the Great Silence. It recovered, however, the malady being diagnosed as a technical difficulty, and Prof. James Churchward resumed his discussion of the peculiar sort of cataclysms from which, forever more, he told us, the earth will be happily immune. The reason we shall have no more magnetic cataclysms, the learned lecturer told us, is that the earth's crust has thickened. 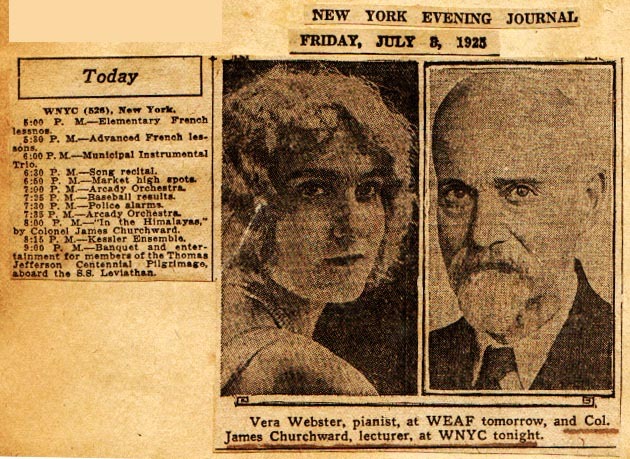 (On the Radio Last Night, Brooklyn NY Daily Eagle, April 17, 1925). Review: He [E.T.] even dished us out of what promised to be a highly interesting and instructive lecture on 'The Land of Mu' by Professor Churchward. Professor Churchward, it was explained, wasn't feeling topnotch anyway and had to catch a train, not caring to wander to the suburbs, or wherever he was going, by the milk express, so we were told that we would have to wait for our 'Mu' enlightenment till a later date. 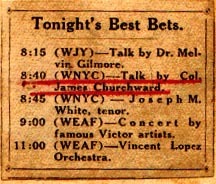 (On the Radio Last Night, Brooklyn NY Daily Eagle, April 25, 1925). 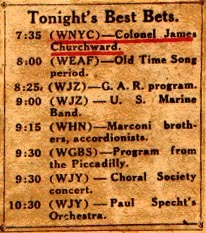 Review: Col. James Churchward, who was talked out of his turn last week at WNYC, got in front of 'Mike' early last night, and declared that though he had been euchred the week previous, he wasn't going to let such a thing happen this time. Then he told us what we were dished out of last week, the wonderful tale of the Land of Mu. 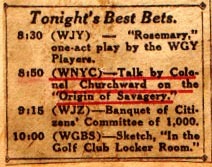 Professor Churchward dealt in no topics of today after the manner of Will Rogers. Everything Mu-ish happened over 16,000 years ago, and we just had to believe all he said about those dear old days. Nothing was said about the Mu cows, or any of the other homely things of life in the Land of Mu, but as a hylogriphical tale it was a first-rater. We learned a lot about cosmic eggs from which the ancients believed life came. We used to know some barnstorming actors that had good reason to share that notion. 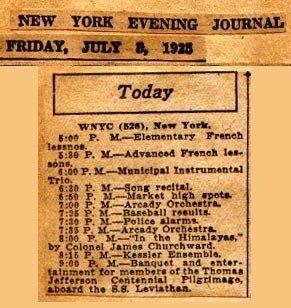 (On the Radio Last Night, Brooklyn NY Daily Eagle, May 2, 1925). Permission for reproduction is not granted without written authorization from the author.